Dog travel is one of the newest trends in America. Thanks to advocates like Vacation Pet Friendly and its partners, it’s here to stay. If you’ve never experienced dog travel, don’t hesitate. The first trip is the scariest. Once you find how easy it is, you are on the road to a lifetime of fun and exciting trips with your favorite furry friend in tow. The first step is to find a hotel that takes pets. Fortunately for canine owners, all pet friendly hotels accept dogs, while this is not so with cats. Vacation Pet Friendly has more than 35,000 of them listed and we’ve negotiated the lowest deals and pet perks that can’t be found elsewhere. Plus, the hotels that are pet friendly, truly seem to love their four-legged customers. Often, your pet will have his own bed and food and water bowls. Many hotels go all out with gourmet treats, photos of your pet in the room upon arrival and gift boxes filled with an assortment of pet goodies. Furthermore, many of our hotels offer such niceties as a free breakfast buffet, complimentary night’s stay, and no-fee Internet and parking. Reservations may be made through the website or via telephone at 877-797-1946. Once you’ve reserved your hotel, make sure to send us your conformation number via our Contact Us page so we can send you a free gift as a token of appreciation. It may be John Paul Pet travel wipe samples or Doggie Shades, but we do want to make sure to start your trip off right. Deciding on a place to stay is another important factor. See what the amenities are in way of the pet friendly hotels at your destination. Some will allow your pet to stay in your room; they may even provide a dog bed. Others may require animals to spend the night in a different part of the hotel. It pays to do your research ahead of time and see what your options are. Renting a cabin or condo may be more comfortable for you and your pet. Either way, be prepared to pay a pet deposit, and possibly an additional fee for the length of your stay. Now that you know what to look for and specific things for which to plan, you can start making arrangements for your dog travel! Vacation Pet Friendly has more than 35,000 pet friendly hotels in the U.S. alone and most have great pet and human perks galore! Here you will find pre-negotiated discounts up to 65% off for pet owners. At many of our hotels, you’ll also be entitled to the benefits at many of our hotels such as a free breakfast buffet before surfing from website to website to the point of confusion. Here’s a good article on pet friendly hotels you will want to read. Learn which are the best airlines for your needs, as well as a full list of hotels, motels, campgrounds and rentals that will welcome you and your dog. Just a reminder: Input your trip number at our Contact Us page so we can send you a free gift as a token of appreciation. It may be John Paul Pet travel wipe samples or Doggie Shades, but we do want to make sure to start your trip off right. There’s so much fun to be had when traveling with dogs. Look at some of what goes on in New York City. Of course, it’s the New Yorkie Fashion Show! Plus, to keep you from getting overwhelmed, here are some basics you should know about dog travel. The second step is to check out the many things to do in and around where you are traveling . For example, if you are visiting Las Vegas, simply go to our Travel Guide For Las Vegas. Vacation Pet Friendly has listings for pet friendly parks, beaches, events, expos, interesting places to visit and activities. We think you’ll be surprised at how many attractions, touring companies, gardens and other places accept pets nowadays. One of the added benefits of dog travel is if you love the great outdoors, there are plenty of hiking trails in the U.S. But whether you want to simply walk through the towns, go on a tour, stroll through the nearby parks, every city and town has something for everyone and it’s helpful to get a feel for what’s pet friendly at your destination before arriving. Vacation Pet Friendly are the experts in pet travel and our goal is to make dog travel easy so no family members get left behind. There is a lot of information on the website that can help such as this article on pet friendly vacations. If your travel destination is within reasonable driving distance, you should seriously consider hopping in the car with your furry friend in a car restraint of some type. Driving is a great option because it allows you keep an eye on your pet at all times. If your dog isn’t accustomed to being in the car, start taking him for little trips. Start taking your dog with you on short errands; drive to the park or dog beach, or the pet supply store. Rewarding your dog with treats for good behavior during the car ride will help make him more comfortable with it. Some dogs become anxious during car rides; if all your practice runs end in taking Sparky to the vet, this anxiety is most likely a learned behavior. Here’s an article on pet friendly car rentals you need to read. Flying is alright if you have a smaller dog. Many of today’s airlines will allow you to carry your dog with you into the cabin provided that its carry case is small enough to fit under the seat in front of you. Usually, this means you have to be a small breed, or one that weighs less than twenty pounds. A larger breed will be required to travel in a crate in the cargo section of the plane. To make this experience as comfortable as possible, line the crate with old blankets and sheets. The smell of home may help to calm your dog. Also add a few of his favorite toys. Whether your pet is flying in the cargo hold or in the cabin, don’t over feed him or give him water before take off. Some dogs do well with a little decongestant to make them sleepy. Ask your vet first before giving your animal any over the counter drugs. The second step is to check out the many things to do in and around where you are traveling. Vacation Pet Friendly has listings for pet friendly parks, beaches, events, expos, interesting places to visit and activities for every city. We think you’ll be surprised at how many attractions, touring companies, gardens and other places accommodate pets nowadays. 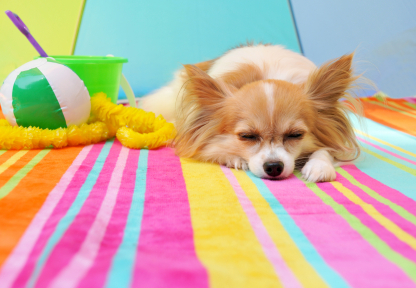 Read this article on pet friendly vacations.